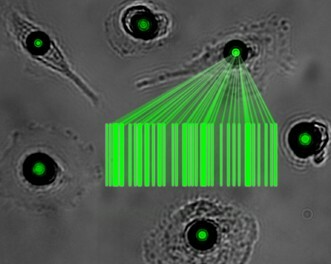 Embedded microlasers could allow scientists to track and distinguish between several hundred thousand cells simultaneously. The approach could enable new forms of cell tracking, intracellular sensing and adaptive imaging, according to researchers at the University of St. Andrews. Cells implanted with microlasers remain viable for several weeks, they said. The microlasers are based on whispering gallery mode resonators — tiny plastic beads that trap light within a small volume by forcing it onto a circular path along their circumference. The spectral composition of the light they emit depends on their size and refractive index, meaning that different types of resonators can be used to generate unique, barcode-like signatures. Pumped with nanojoule light sources, the resonators lase without causing cell damage. Cells were induced to “swallow” the microlasers through endocytosis, the process through which cells absorb molecules such as proteins. Certain types of cell were particularly quick to absorb the microlasers, the researchers said. Macrophages, a type of immune cell, internalized the resonators in less than five minutes. But even cells without pronounced capacity for endocytosis readily internalized the microresonators, showing that laser barcodes are applicable to many different cell types. Previously reported cell lasers required optical resonators that were much larger than the cell itself, meaning that the cell had to be inserted into these resonators, the researchers said. The research was published in Nano Letters (doi: 10.1021/acs.nanolett.5b02491).